The team-based approach to power integrity starts early in the design process when selecting decoupling capacitors and adding them to the schematic. The Cadence® Allegro® Sigrity™ PI analysis enables passing this design intent to layout designers through constraints and much more. You are further enabled with DC analysis technology and then PI experts can step in and validate the finalized design for AC and DC performance, ensuring that the power delivery network (PDN) is working to spec and fully optimized. With low power becoming a high priority for electronic designs, power integrity can no longer be an afterthought. 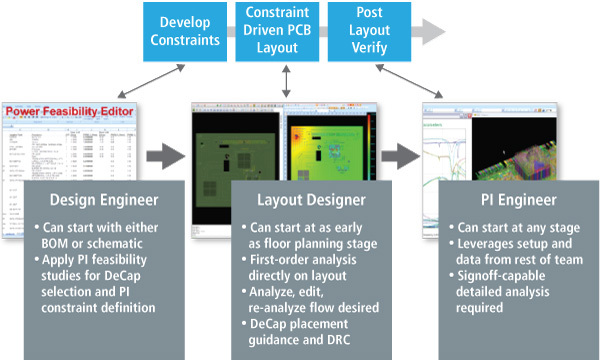 A constraint-driven power integrity flow keeps PDN design as a forethought throughout the design process. The Cadence Sigrity team has expanded on the proven constraint-driven flow for signal integrity and recently added constraint sets that are specific for power integrity. 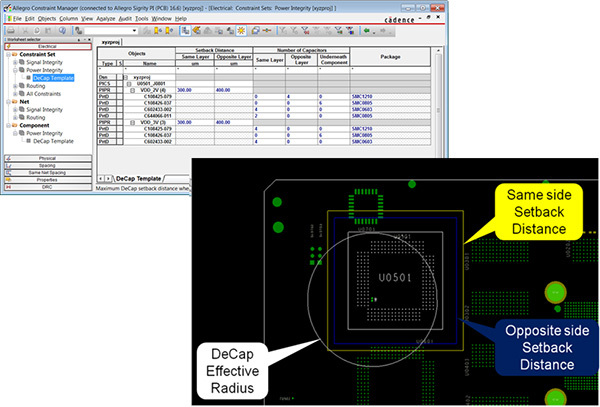 Allegro Sigrity PI technology supports the full design flow by enabling the capture of PI Csets early and guiding PCB designers to follow the constraints associated with decoupling capacitor selection and placement. But the PCB designer’s job doesn’t stop there. When using Allegro Sigrity PI, PCB designers can run IR drop analysis and find locations where the PDN cannot deliver sufficient voltage. So not only are they able to properly decouple a design, they are empowered to address first-order DC concerns. When the design is complete and power integrity signoff is required, PI experts can use the Allegro Sigrity PI solution to run full-featured AC and thermal-aware DC analysis tools as well as decoupling capacitor optimization. With access to the Allegro PCB Editor, the experts can easily communicate to PCB designers what needs to be accomplished to both optimize and signoff on the power delivery network design. With a power delivery network validated with the Allegro Sigrity PI solution, you can build your design with confidence knowing that efficient, sufficient, and stable power will be delivered to the components on your design and that product creation time will be minimized.